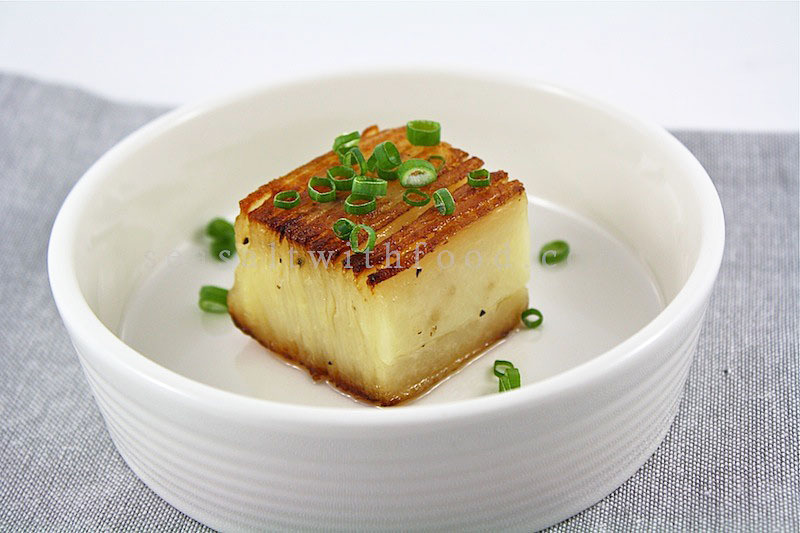 This is a very versatile potato dish, also known as layered potato or Potato Pavé. Pavé is the French word for cobblestones or also known as paving stones. The potato can be served hot or at room temperature. It tastes great on its own or served as a side dish with any meat main course. Crispy on the outside and creamy inside, tastes great! Here, I had used 4 large Russet potatoes, peeled and trimmed according to the width of the baking tin. Then, I called upon my faithful mandoline to thinly slice the potatoes evenly. After baking the potatoes in the oven, let it cool and refrigerate for at least 6 hours. When ready to serve, just cut and pan fry them till golden brown. I find it easier to make this a day ahead and serve them the next day. This recipe was adapted from Thomas Keller’s “ad hoc at home” cookbook. For your convenience, I have appended a link to a video guide on making this great tasting Potato Pave from Martha Stewart’s website. I am certain you will definitely find it much easier to prepare the potato after viewing the video. Have fun trying it and have a good weekend. Pour the cream into a large bowl and season with 1 tsp of salt and ½ tsp pepper. Peel the potatoes. Cut a thin lengthwise slice off one side of a potato so it will rest flat on the mandoline. Lay the mandoline slicer over the bowl of cream and slice the potato lengthwise into very thin (about 1/16 inch) slices, letting them drop into the cream. (If you can’t lay your mandoline across the bowl, slice the potatoes, adding the slices to the cream as you go.) Stop from time to time to toss the slices in the cream to keep them coated and prevent them from oxidizing. Repeat with the remaining potatoes. Brush a 10 x 6 ½ x 3-inch loaf pan with half the softened butter. Line with parchment paper, leaving 5-inch overhang on the 2 long sides. These extensions will be used to cover the potatoes as they cook and later serve as handles when unmolding. Brush the parchment with the remaining softened butter and sprinkle with salt and pepper. 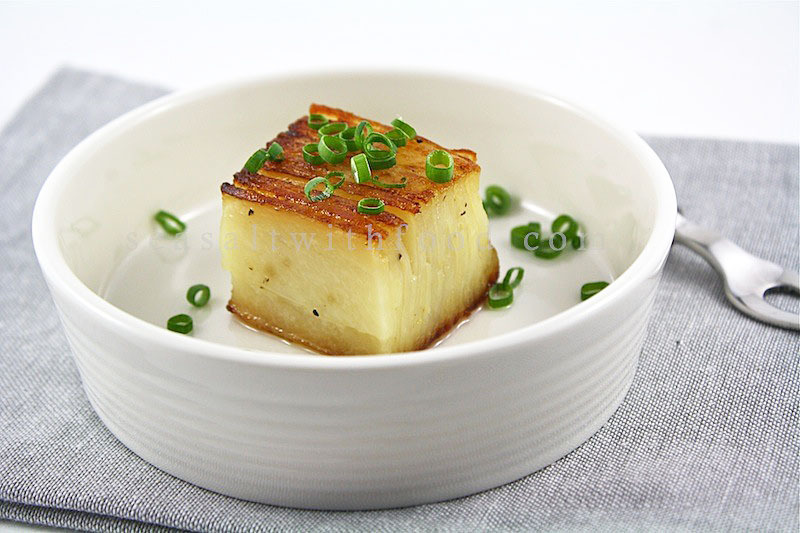 Bake the potatoes for 1-½ hours, or until completely tender when pierced with a tip of a knife or a wire cake tester. Remove from the oven and let cool for 15 minutes. Put a weight on top of the potatoes, cool to room temperature, wrap well and refrigerate for at least 6 hours, or up to 2 days. To serve, run a palette knife around the two longer sides of the pavé to release from the pan, and use the parchment handles to lift the potatoes from the pan, or invert onto a cutting surface. Trim all sides of the pavé. Cut the pavé into 12 equal pieces (or any size of your choice) and let it sit at room temperature for 30 minutes. Heat some canola oil in a large frying pan over medium-high heat. Add the potatoes cut side down, add the thyme and garlic, and cook, basting with the liquid in the pan, until browned on the first side, then turn carefully and brown the opposite side. So sophisticated and elegant looking pics!! Beautiful! So beautiful, I don't think I'd want to ruin it by eating it. That looks so good! Am a huge fan of potatoes, and this must be so good. Definitely worth all the effort. I've been seeing these EVERYWHERE! Stunning!